Cervical intraepithelial neoplasia grade 2 (Richart) is a preneoplastic lesion of squamous epithelium which corresponds to previous moderate dysplasia. 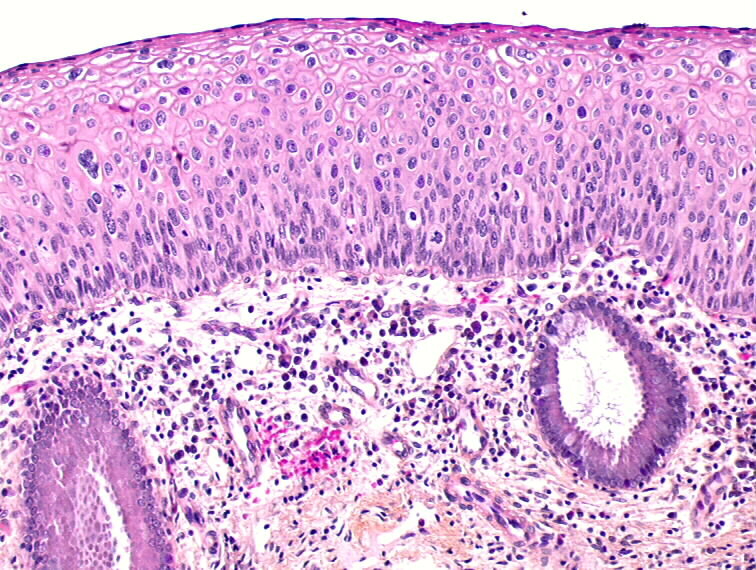 Histologically, basal cell hyperplasia extends from the basement membrane to the middle third of the squamous epithelium. The cell differentiation does not proceed above the parabasal or deep intermediate cell. Nuclear abnormalities and cytoplasmic maturation anomalies are present. Mitoses are visible in the lower two thirds. Keratinization may be present, at the surface or in isolated cells inside the epithelium. Koilocytosis is frequently observed.